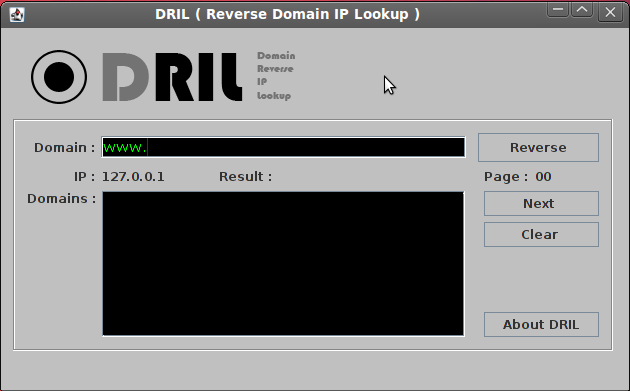 DRIL ( Domain Reverse IP Lookup ) Tool is a Reverse Domain Tool that will really useful for penetration testers to find out the domain names which are listed in the the target host, DRIL is a GUI, JAVA based application which use the Bing API key.DRIL has a simple user friendly which will be helpfull for penetration tester to do there work fast without a mess .this is only tested on linux still , been java it should work on windows to. There are online tools available, But many times due to slow internet connectivity we intend to get frustrated while audits. this tool is small and handy will not consume harddisk space So, its simply an good and fast altenative.